It’s a curious thing that the individuals who motivated me to write this book are those who have caused me the greatest pain. Tales of suffering are best told by those who have suffered themselves. However, at times these same individuals have brought good into my life, and so I thank them for that instead. Until her own voice was swallowed by dementia, my mother was the best encourager an author could hope for. Even now, I sometimes catch a glimpse of her silenced love and maternal pride. She would be delighted to know that we are finally sharing this story with the world. Thank you, Mom, for your many decades of unfailing devotion and support. I’m also grateful to my children, each of whom has offered encouragement in their own special way. No doubt my lovely, literate daughters, who both share my appreciation for all things beautiful, will find themselves among the pages of this book. And though neither of my sons enjoys reading, I am thankful they are willing to help with the mundane tasks of life, especially keeping that pesky grass at bay. My siblings are an ongoing source of refreshment for me, when work and woes tend to suffocate the pleasures of life. I am grateful for my four professional and somewhat competitive sisters, as well as my kind-hearted sister-in-law – we are more alike than we know. It is a blessing to have so many to whom I don’t have to explain myself. And then there’s my Mensa-minded brother, who has repaired my drywall, fixed my wiring, plumbed my sinks, installed my floors, and generally kept my house from falling down around me. It’s OK if he doesn’t read my book – I have other projects waiting, and am most appreciative of his help. My literary sisters Terrie Wolf and Margaret Dixon, both experts in the printed word, deserve heartfelt recognition for their early review of my manuscript, and for inspiring me to become a better editor of my own work, even when it hurts. I also owe a debt of gratitude to both the writer and translators of the Biblical book of Job, without whom this story would never have been written. Elements from several sources and commentaries were amalgamated into my own paraphrases and conjectures. I have tried to remain faithful to the original record and do not claim that my fictional account reflects what otherwise transpired, except to the extent that these characters surely had hopes and dreams beyond that which was transcribed. Special appreciation goes to Katrina DeFord, who assisted with the beautiful cover design. Lastly, and above all, I wish to thank my Creator for sharing his love and creativity with all humankind, and in particular with me. Have you ever been hurt so badly that you’ve felt your life is over? Worse yet, have you been told you deserve such unhappiness? Is God to blame for your suffering? Meet the wife of Job, whom many a preacher has criticized for her words of despair, dismissing her as a mere footnote in their terrible tale of destruction. But there has to be more to her story, as anyone who has endured grief or depression would know. What might have happened? Why would she urge her husband to curse God and die? In this fictional account, Job’s wife relates her unvarnished tale, from childhood onward. Looking back from the perspective of her final days, she tries to make sense of their near annihilation. Her childhood is a happy one, though not unmarred by tragedy. And though Job loves Ix’ises from the day she was born, their future together is threatened by her father’s debilitating accident. When they do finally marry, their union is blessed, year upon year, with no end to happiness in sight. Until one day tragedy strikes and all is lost. Wealth, workers, children – all gone in a day. Though Job’s faith allows him to cope with the calamity, Ix’ises herself is lost in a desperate spiral of anguish and desolation from which she cannot escape. Job remained her only lifeline, sustaining her by but a thread – until the day Job was stricken, falling frightfully ill, soon ready to die himself. “Job’s body wasted away, a desiccated skeleton draped with fetid, rotting flesh. Every morning a new horror, each evening a nightmare of dread.” It was more than she could bear. Yet they remained together, though nearly hopeless, still facing the nightmare as one. How does one recover from such devastating loss? As the author, I pray that following one woman’s journey back to wholeness may someday help you in your own hour of need. Still active in clinical medicine, Cynthia J. Koelker, MD spent nearly three decades raising her four children and working as a family physician before beginning her writing career. She holds undergraduate degrees in humanities and biology from MIT, studied medicine at Case Western Reserve University School of Medicine, and more recently obtained a Master of Music in composition from the University of Akron. A member of Mensa, she continues to reside in her native state of Ohio, along with four generations of her family (including two beloved goldendoodles), and often plays piano for her local church. 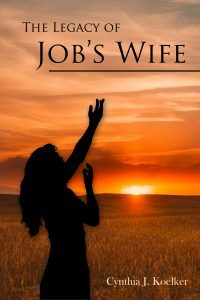 Over the years she has counseled hundreds of patients dealing with depression, heartache, and loss, as reflected in the characters of The Legacy of Job’s Wife. In conjunction with her book release, she is available to speak with interested groups or audiences, either in person or remotely, regarding her book or related topics. She may be reached online by submitting an inquiry at www.JobsWife.com, or by contacting her office at 213 Massillon Road, Akron, Ohio 44312. Her non-fiction self-help book, Armageddon Medicine, How to Be Your Own Doctor in 2012 and Beyond, is available for purchase at www.ArmageddonMedicine.net.